The Secretary for Labour and Welfare, Mr Matthew Cheung Kin-chung, met with the Consul-General of Japan in Hong Kong (Ambassador), Mr Kuninori Matsuda, at Central Government Offices, Tamar, today (August 25) to announce that the reciprocal annual quota of the Hong Kong/Japan Working Holiday Scheme will be significantly increased from 250 to 1 500. Photo shows Mr Cheung (right) and Mr Matsuda signing the documents concerning the increase of the reciprocal annual quota of the Scheme. 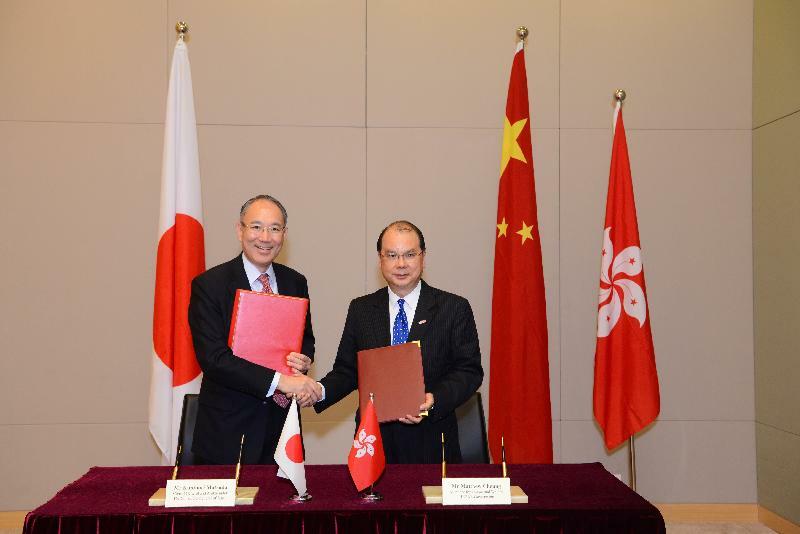 The Secretary for Labour and Welfare, Mr Matthew Cheung Kin-chung, met with the Consul-General of Japan in Hong Kong (Ambassador), Mr Kuninori Matsuda, at Central Government Offices, Tamar, today (August 25) to announce that the reciprocal annual quota of the Hong Kong/Japan Working Holiday Scheme will be significantly increased from 250 to 1 500. Photo shows Mr Cheung (right) and Mr Matsuda exchanging the documents concerning the increase of the reciprocal annual quota of the Scheme. 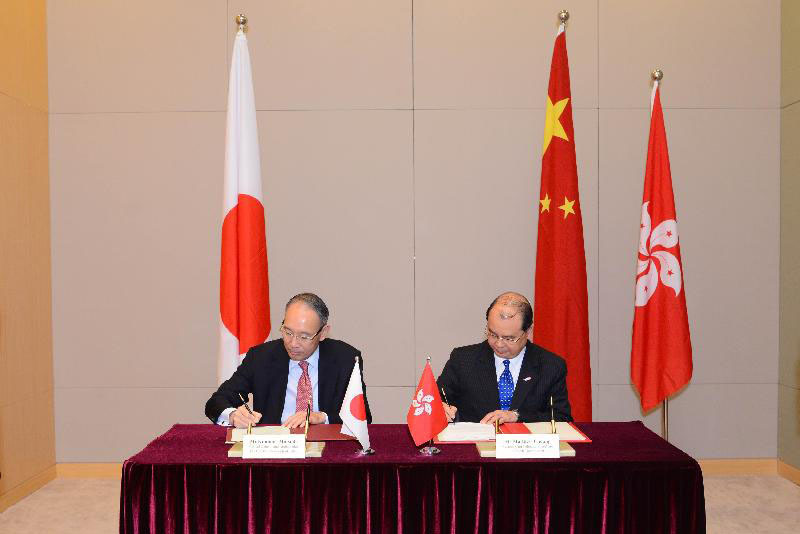 In view of the enthusiastic response to the Hong Kong/Japan Working Holiday Scheme (WHS), the Government of the Hong Kong Special Administrative Region (HKSAR) has reached an agreement with the Japanese Government to significantly increase the reciprocal annual quota from 250 to 1 500. The Secretary for Labour and Welfare, Mr Matthew Cheung Kin-chung, met with the Consul-General of Japan in Hong Kong (Ambassador), Mr Kuninori Matsuda, today (August 25) at Central Government Offices, Tamar, to sign and exchange the documents on the quota increase. Welcoming the quota increase, Mr Cheung said, "The Hong Kong/Japan WHS has been well received by Hong Kong youths since its establishment in 2010. Around 1 700 Hong Kong youths and 450 Japanese youths have joined the WHS so far. The substantial increase in the quota will provide more opportunities for youths from both places to broaden their horizons through living and working temporarily in Hong Kong or Japan while holidaymaking. It will also enhance the cultural exchanges between the two places." Under the Hong Kong/Japan WHS, Hong Kong youths aged 18 to 30 who hold a valid HKSAR passport or a British National (Overseas) passport and have not participated in this WHS before may apply for visas. Successful applicants may stay in Japan for up to 12 months, during which they can take up short-term employment and engage in short-term courses. Under the new arrangement, the Consulate-General of Japan in Hong Kong will increase the quota to 750 during the second round of application of 2016 for working holiday visas. Hong Kong applicants may visit the website of the Consulate-General of Japan in Hong Kong at www.hk.emb-japan.go.jp/eng/ for further details. The Government of the HKSAR will correspondingly increase the quota for Japanese applicants in 2016. For details, please refer to the Hong Kong Immigration Department's website at www.immd.gov.hk. Since 2001, the Government of the HKSAR has established bilateral WHS arrangements with 10 economies. Apart from Japan, the other partners are New Zealand, Australia, Ireland, Germany, Canada, Korea, France, the United Kingdom and Austria. So far, over 71 000 Hong Kong youths have joined these schemes. Hong Kong youths are welcome to join the WHSs. The Government of the HKSAR also reminds WHS participants to take out appropriate insurance policies and plan ahead before departure. They must stay vigilant while travelling abroad, always observe local laws and be cautious in dealing with the terms and conditions laid down in employment contracts to protect themselves. In case of accidents or serious incidents during their stay in the partner economies, WHS participants should immediately approach the local government authorities for assistance. They may also approach the local Chinese Embassy or Consulate, or call the 24-hour hotline of the Assistance to Hong Kong Residents Unit of the Immigration Department on (852) 1868.